Richard Bland Ravenor, Australian Navy? The Ravenor residence in Oxford St, Nebwury. Now part of The Chequers. Richard was born on 14 August 1876, the third of eight children born to Richard Ravenor and his wife Charlotte Christian (née Bland). 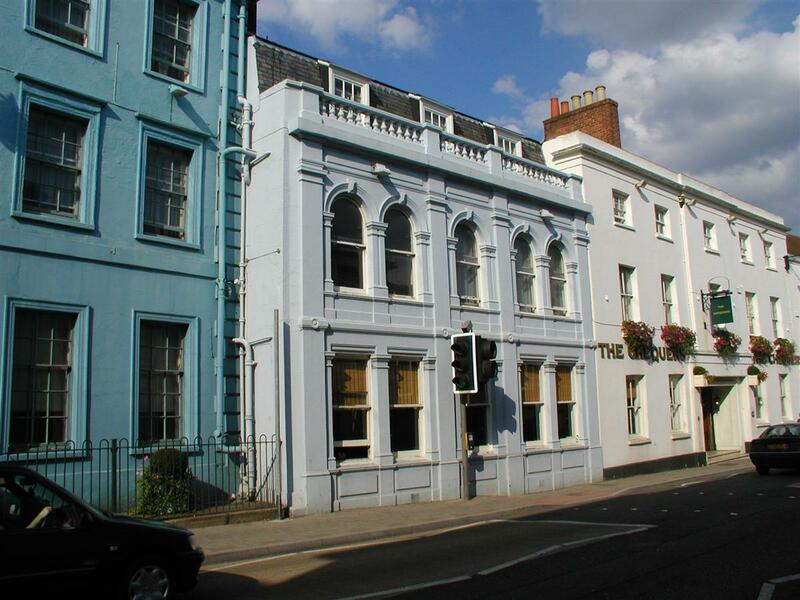 Richard was a succesful local businessman running a plumbing and glazing company (initially in partenership with his brother Henry) that evidently provided a very good income. The family home on Oxford Street in the Speenhamland area of Newbury was a very substantial residence, around 1935 it was purchased by Trust Houses and incorporated into the Chequers Hotel next door. He was also active in local government serving as Mayor of Newbury in 1885 and as a Borough councillor or alderman from 1878 (when Newbury's boundaries were extended to encompass Speenhamland) until his death in 1917. Richard's life was supported by the relative wealth of the family, but this was evidently not enough for young Richard - he caught gold fever. In The Only Yukon-Alaska Directory for 1901 a 'street' directory for the Klondike goldrush area compiled 1899/1900 he appears in Dawson City, Yukon Territory as a miner. By spring 1901 he was back in England giving his name in the census of that year as a 'prospector'. In 1903 he is off again, sailing on the SS Orotava to Adelaide, Australia. However, Adelaide was not his final destination, he was once again bound for the gold fields, this time in Western Australia, where he appears in the 1903 electoral roll for Kalgoorie. Then, in 1916, he met his end, in circumstances that led to his parent’s belief that he was serving with or attached to the Australian Navy - explaining his presence on the Newbury war memorial. However, it is clear that he was not in the Navy, perhaps he was carrying out some work for the Navy as a civilian contractor. The report of his death in his probate records shows that he died on 20 July 1916 in the harbour of Shortland Island and that he was a trader and planter with a permanent residence on Treasury Island on the British Solomon Islands Protectorate. Shortland Island is a small spot about 2/3rd of the size of the Isle of Wight at the north of the Solomon Islands, south of Bouganville. Treasury Island probably refers to Mono, largest of the Treasury Islands, but still far smaller than Shortland 15 miles to the north east. The solicitors handling the estate on behalf of Richard's mother were W H Belcher & Co - William Henry Belcher also lost a son in the war, Basil Belcher is another name on the Newbury memorial. There was no mention of Richard’s death in the local newspaper obituaries for his brothers Herbert and Geoffrey or his father Richard - all of which appeared in the months following his death. The last of these obituaries, that of his father, was published in March 1917 it was suggested that the deaths of Herbert and Geoffrey had hit him hard: it seems possible that Richard jun's death was not known of in Newbury at that time. Richard is not commemorated on the Australian War Memorial or by the Commonwealth War Graves Commision. They Whom this Scroll Commemorates were numbered among those who, at the call of King and country, left all that was dear to them, endured hardness, faced danger, and finally passed out of the sight of men by the path of duty and self-sacrifice, giving up their own lives that others might live in freedom. 2nd Lieut GEOFFREY PAXTON RAVENOR, Killed in France – Royal Berks Regiment. HERBERT RAVENOR, 15th Batt Australian Infantry, Killed in France. RICHARD BLAND RAVENOR, attached Royal Australian Navy, drowned at sea. Locally Richard is remembered on Newbury's Town War Memorial. Killed in France Oct 2. 1916. Aged 23. 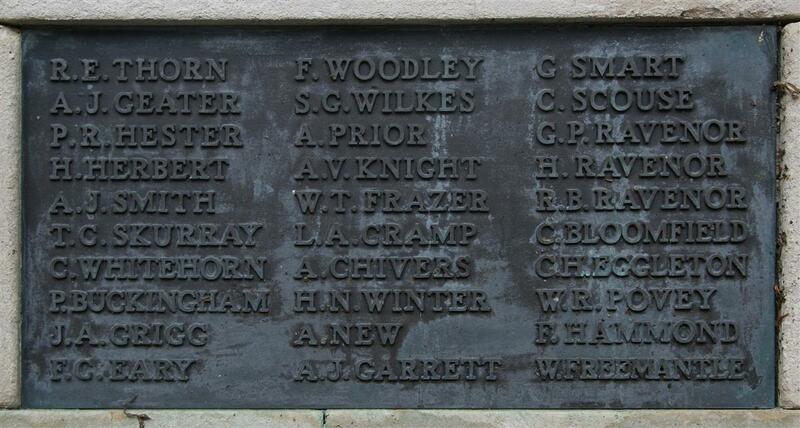 His brothers, Geoffrey and Herbert Ravenor are also remembered on the Newbury war memorial, and their mother's grave. Geoffrey died on the Somme serving in the 6th Battalion, Royal Berkshire Regiment; Herbert died serving with the Australian Infantry Force in France. Another brother, Cyril, served in the merchant marine and Royal Navy while Maurice was engaged on war work to do with the development of submarines. The final brother, Stanley Arthur, remained at home in Newbury taking on the business following his father's death; following the Military Service Act of 1916 he had been classified as 'C1' (fit for garrison service at home) and was liable for call up. He appeared at a series of local tribunals staving off a call up on compassionate grounds following the death of his father. In May 1918 he was granted a final two months reprieve, his argument that his call up meant the end of the once successful business went unheeded, thousands of others were in the same situation. It is not known if he was ever called up; the need for men on home duty was not as great as those who could be sent abroad. Another member of the family, Richard's cousin Private Alexander Mitchelson Ravenor, who had lived for a period in Newbury, died on 11 March 1915, while serving with the Royal Berkshire Regiment on the western front.